Circular hand-painted cards were once made for royal play and were hugely popular. Brought to India by the Mughals as the Persian Ganjifa, they evolved into the Indian Dashavatara and Ramayana cards. Made, in various parts of the country, today, they are more a piece of art than just a deck of cards. Once a game played in palaces, ganjifa got lost with time. With no royal patronage or players, and newer games in picture, this card game became history. Although it did make its way back, but more as a piece of art and a collectable item than a game. If ganjifa survives today, it is because of artisans and not players. Made in various parts of the country, it varies in local names, designs and the stories associated with the artwork. Interestingly, some of the artists making it today, are heirs of an art legacy, as their ancestors made the ganjifas for the royal courts. Sawantwadi ganjifa in Maharashtra, navadurga ganjifa in Odisha, Bishnupur ganjifa in West Bengal and Mysuru ganjifa in Karnataka, the game in different states, derives its art inspiration from local legends. In Odisha, the artwork is derived from Hindu god Krishna’s life whereas in Mysuru ganjifa, goddess Chamundeshwari can be seen for the motif. The cards however remain round in shape everywhere. In each state, not only the artwork varies, but also the style in which the motifs are made on the discs. The cloth, on which the artwork is to be made, is treated in varied ways. In Odisha ganjifa, for instance, the cloth is treated with tamarind in order to make it stiff. 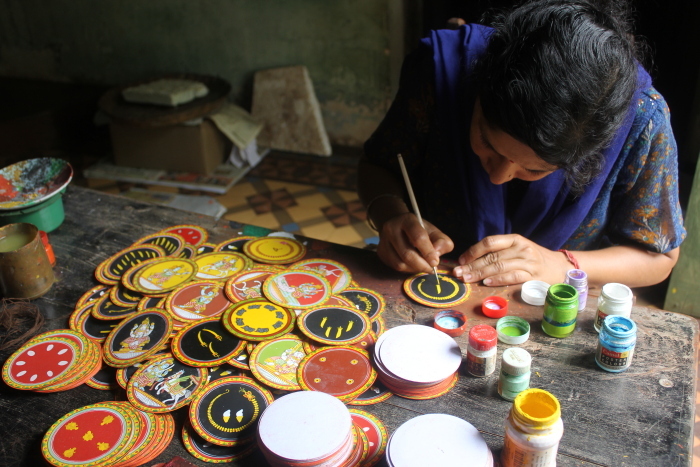 In Bishnupur ganjifa, one comes across larger circular shaped cards, each made with 10 layers of cloth. During the royal era, when the game used to be played by kings, the cards were made on ivory or even tortoise shell. It was after it gained a following amongst the commoners, the cards began to be made on inexpensive and easily sourced material such as wood, cloth and paper. The artists stroked scriptures from Hindu cultures with natural colours, which they made from vegetables. Ganjifa, in course of its popularity evolved into dashavatar cards (dashavatar is a term used for the 10 incarnations of Hindu god Vishnu, that were painted on the cards) and Ramayana cards (with stories from the popular relic of the same name). Traditionally, the game used to be played by five players, with a pack of 120 cards — 10 suits of 12 cards each, while each suite corresponded to an avatar of Vishnu. A detailed description of an eight-suited pack of Mughal ganjifa or the game with 96 cards can be found in regal advisor and writer Abul Fazal’s Ain-i-Akbari. Today, the ganjifa art lives, not just on round cards, but also on wall hangings, paintings, and fashioned in other commercial and creative ways. Also, other than images of Hindu gods and goddesses, figures of cows, flowers, et al, are crafted as they hold certain symbolism.